With an overall width of just 1.45m the new Manitou MC18 rough terrain forklift is designed for work in restricted spaces. The ultra-compact material handler is also just 2.95m long and has a cabin height of 2.15m. If you have height restrictions such as door entry requirements that height can be reduced to a mere 1.99m by going for the ‘Buggy’ version. Both models have the same maximum capacity of 1.8 tonnes, maximum lifting height of 5.5m and high ground clearance of 30cm, which the company says is the highest clearance on the market. To allow operators to monitor the load throughout the lift Manitou has designed a new panoramic glazed roof without a metal structure for the new truck. This is composed of two tempered glass sheets separated by a plastic film (essentially creating laminated glass which meets ISO 6055 (FOPS) safety standards. A double-skin cover consisting of a tough, rigid section and a flexible insulated section reduces noise to 79dB, below the market average of 86dB. The MC18-4 offers the option of switching from two-wheel to four-wheel drive, whether the machine is in operation or not. The 4WD gives the MC18 improved driveability and traction, while the 2WD allows you to reach a speed of 25km/h.. Manitou says this leads to a 12.5 per cent reduction of fuel consumption in the handling cycle. Engine access has been made easier through the use of a cap just behind the operator's seat which allows the user to check the various levels without needing to lift up the cab or have special tools. 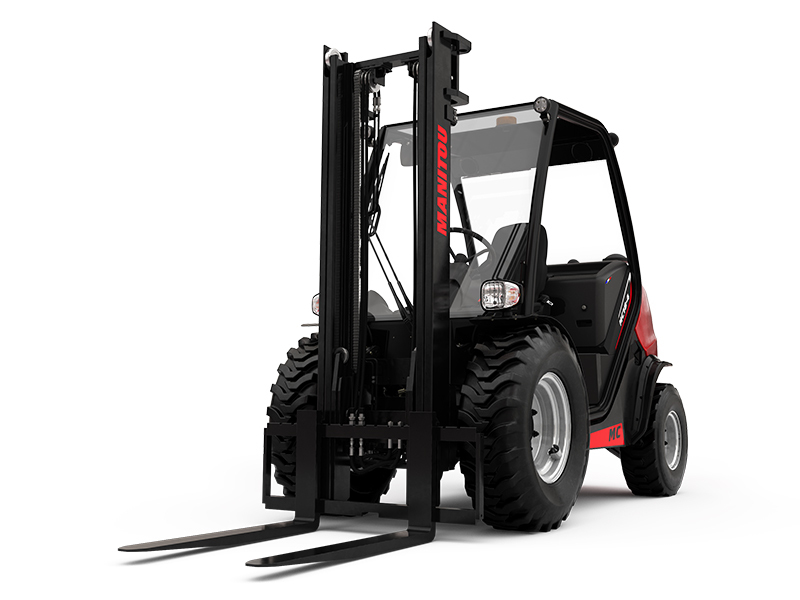 "In close collaboration with our engineering office, we have designed an ultra-compact forklift that enables farmers to get around pathways easily," Manitou lift truck marketing manager Patrick Laridan says. "It is a product that is perfectly suited to market gardeners and nurserypeople working in sometimes difficult terrains. "With a total cost of ownership among the lowest on the market, we can say that with the MC18 we have reinvented the rough-terrain forklift!"